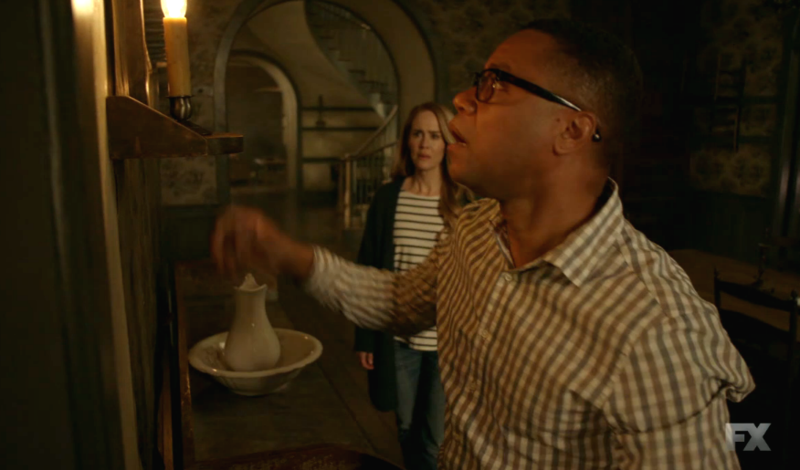 Ryan Murphy just revealed there's a HUGE TWIST coming on "American Horror Story: Roanoke"
Hello, we’re two episodes into American Horror Story this season, and we finally know the theme, it’s Roanoke!! Or do we?? After a month of nothing but crazy American Horror Story promos, we discovered that the show is set in Roanoke — location of the Lost Colony of Roanoke — and it’s taking place in the past and present, via a documentary format. Is your mind already spinning? Well great, prepare for it to do a 180°, because according to Mr. Ryan Murphy, he is only just getting started and things are not what they seem. ORLY NOW. There’s a twist coming, huh? Maybe a twist like, IDK, like the fact that the actors/reenactors are really swapped, and the REAL Shelby is actually Sarah Paulson? A theory like that? Though that’s a damn good theory, that probably not it (even though we can still hope). It sure sounds like Murphy and Falchuk believe NO ONE has figured out the twist, including us, so that means it’s back to the AHS Theories Drawing Board. WHAT. DOES. THAT. MEAN. How many more ~~twists~~ can there possibly be in AHS?? Like there honestly might be a time where there are just TOO many AHS twists, and we’re getting close to that. We’re almost at Peak AHS Misdirect, you guys. So this big twist better be hella good, Murphy.